In a changing world of limited resources, the focus is increasingly turning to renewable and sustainable energy solutions. Renewable AND sustainable you ask? “Yes,” says Professor Herman Vermaak, acting Dean of the Faculty of Engineering and Information Technology at the Central University of Technology (CUT) in Bloemfontein in the Mangaung Metropolitan Municipality. “They [renewable and sustainable energy] are distinctly different and we as academics have an obligation to create awareness,” he says. One of the ways his institution is creating awareness is through innovative projects such as the recently launched Solar Flower. Stationed on campus, the Flower is a solar-powered mobile phone charging hub, conceived, engineered and manufactured entirely by the CUT staff and students. According to Vermaak, the Flower was born in response to the growing energy demands of tech-savvy students. “We noticed so many more students around campus with smartphones, tablets, using these tools in all aspects of their lives,” says Vermaak. 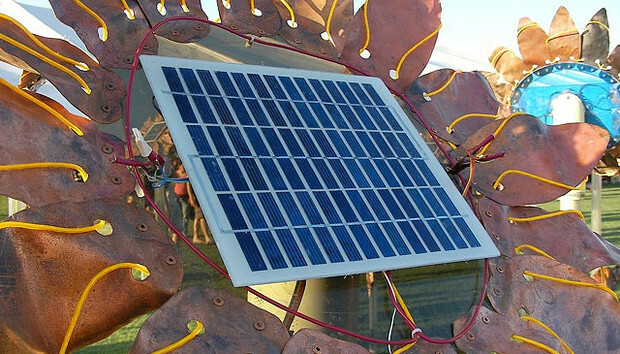 He says the prototype Solar Flower can charge any device, which is one of the challenges the team had to overcome in enabling it to cope with the variety of cellular makes and models on the market. Phones are charged via a USB port and Vermaak says plans are already in the pipeline to develop a Flower to cope with the energy demands of laptops and tablets. “Our current energy generation methods, such as coal-powered stations, for example, are not good for the planet, and they are not good for our health. Here was an idea just waiting to be done, so we did it,” he says. Electrical Engineering student Teboho Dintwe worked on the regulator to convert the sun’s energy to a lower voltage suitable for mobile devices. “Well, my contribution was pretty easy,” says the young student. “I basically had to take the high-voltage input from the sun and make it lower so it wouldn’t burn or damage the phones. And now, as long as you have a USB cable, you can plug in your Blackberry, iPod, Samsung, whatever, and charge for free,” he says. Dintwe, whose first love actually lies in the field of robotics, says he was stumped for an idea for his practical when his mentor suggested he get involved with this project. “I am so happy I did; it is not the kind of thing I thought I’d be making and now I’ve even appeared on TV,” he says. Vermaak says the interest around the Flower and its role in generating awareness is even more significant than the engineering aspects or the value-added benefits for students on campus. “The majority of people see renewable energy as a solar-powered geyser, this is about letting them see things in a different way, see life in a different way,” he says. Even at grassroots level, communities are starting to ask about alternative energy options. “People are curious. They want to know what it is about this idea of getting power from the sun,” says Dintwe. He says the exposure the project is getting also has the added trickle-down benefit of inspiring future engineers. “High-school students who see our Flower on TV want to come and study here and I know they [CUT] are going to be introducing renewable energy courses, so it really is going to change lives,” he says. CUT spokesman Dan Maritz says the University’s Department of Electrical, Electronic and Computer Engineering is introducing two new courses in 2014 and 2015 respectively. “The first is a Higher Certificate in Renewable Energy Technologies and the second a Diploma in Sustainable Energy,” he said in a statement. Maritz says the new courses and projects like the Solar Flower fall in line with the institution’s aims to “contribute towards the social-economic development in the region as well as in the rest of South Africa and internationally”. Meanwhile back at campus, the first Solar Flower stands soaking in the African rays as it powers and inspires the next generation of engineers. Sabrina Dean lives in Bloemfontein and has worked in media since graduating from Tshwane University of Technology.